“True inspiration is impossible to fake”. But what if that was not the case? If we said “Don’t think about elephants” we’re fairly certain you just thought of elephants. How could you claim that was your own idea when you know you were given it? Well, imagine if, when you were fast asleep, someone could delve far enough into your subconscious and plant a thought so deep that the real origin of the idea is no longer detectable. Due to Nolan’s iron curtain of secrecy, you probably knew as much about this film as you did astrophysics before going into see it, but there lies the central feature of Christopher Nolan’s offering. If there’s one thing ‘The Matrix’ did for us, apart from bringing back leather, is that it gave way to a whole new genre of sci-fi. The type that makes you question your very existence. And although Inception is similar in that sense – it’s refreshingly original and completely unique. Take note Michael Bay: this is how you make a Hollywood Blockbuster. Ten years ago, the idea began to germinate in Nolan’s mind, not as the sci-fi heist you’ve grow to know, but as a horror film. A decade on, we have a knotty thriller that surpasses The Prestige and even, Nolan’s successful release, Memento. Following on from his supremely victorious second instalment in the Batman trilogy, The Dark Knight, Nolan is a director well and truly at the top of his game. Naturally, there was a certain amount of trepidation surrounding the film, but rest assured, Inception did not disappoint. Make no mistake, this is a proper film. Nolan has rejected fashionable 3D (thank God) which often makes films feel dark, gimmicky and lacking in detail. He has shunted ostentatious tracking shots and constant reliance on green screen in order to make a film based on dreams feel surprisingly real. Together with cinematographer Wally Pfister, who used a variety of frames to capture breath-taking landscapes and claustrophobic close-ups, they have achieved the extraordinary. Shot in IMAX with superb editing, flawless visual effects and Hans Zimmer’s epically intense score makes for a ridiculously immersive viewing experience. Aesthetically stunning, the plot flitters between four layers of a dream. From the grimy, industrial city level which Nolan gave his signature tough Gotham-look, to the corporate hotel layer with its warm colour palette and soft lighting – it is easy to differentiate between them. One minute you’re in Paris, the next Mombasa and the third act transpires in a snow fortress which strongly resembles the architecture of the Geisel Library at UCSD. The difference between this film and the Bourne Trilogy is that you don’t find yourself suspending disbelief as they trot across continents. Dreams mean no boundaries, no laws of physics and plenty of creative licence. protagonist Cobb (DiCaprio) as the serious and introverted “Extractor” burdened with the seemingly impossible task of planting an idea in someone’s mind. His sincere performance is the glue that holds the ensemble together. As one of his finest portrayals, it's hard to imagine anyone managing to encapsulate the depth and hidden turmoil faced by Cobb as impressively as DisCaprio. Mimicking a classic heist movie, Cobb wastes no time in quickly assembling a skilled team with characters that complement each other with chemistry and spirit to rival any strong ensemble cast. Ariadne (Page) as the young, quirky student is given the role of replacement “Architect”, but not in the traditional sense. Niftily taken from Greek mythology, her namesake was responsible for leading Theseus out of the Minotaur’s maze and her character arc shares some uncanny parallelism to our plot. Dileep Rao plays “Chemist”, funny-man and designated driver Yusuf, named after the Prophet, gifted with the ability to interpret dreams. Good luck to all the sceptics who like to pick at loop holes and flaws, because, unlike The Prestige, you won’t find any. This movie is watertight. Cobb’s “Pointman” and sidekick is played by the indie-film staple Joseph Gordon-Levitt who is a far cry from his usual hopeless romantic. He instead exhibits some mind-bending stunts and brings an element of Bond-style panache to the film. Cillian Murphy, one of Nolan’s go-to actors, is back as Robert Fischer, the sleek heir to energy giants Fischer Morrow and the subject of the nail-biting assignment. His vulnerable and helpless representation of Fischer shows an impressive amount of versatility and proves there’s more to him and his protuberant blue eyes than the crazed Scarecrow from Batman Begins. Oscar-winning Marion Cotillard takes on Cobb’s wife and tortured soul, Mal, and provides a remarkable amount of grace and elegance to a male dominated cast. Her name translated means ‘bad’ in both French and Spanish, but of course that’s a coincidence… A stand-out performance comes from future leading man material Tom Hardy. Virtually unrecognisable from the 2008 biopic ‘Bronson’, Hardy is the actor most starved of screen time, his roguish charm and sarcastic disposition of the clandestine “Forger” Eames lights up scenes with playful wit and effortless timing. With the backing of an international, A-list cast and one of the best directors of recent years at the helm, Inception is a dream come true for any studio and good on Warner Brothers for not padding it out and diluting the smartness with incessant shooting. The complexity of Inception is not the flaw that some reviews are jumped on; it’s what makes it successful. For a film so intricate, it is not overambitious because it would be all too easy to feel lost and left out. Nolan’s tremendous narrative skill and trademark slight of hand keeps viewers on the inside and guides them along as a member of the team. So when you see Inception, which let’s be honest, you all probably have, be prepared to debate the ending for the rest of forever. What Christopher Nolan has succeeded in creating is an immensely intelligent film that challenges the audience but isn’t self indulgent and non-accessible. 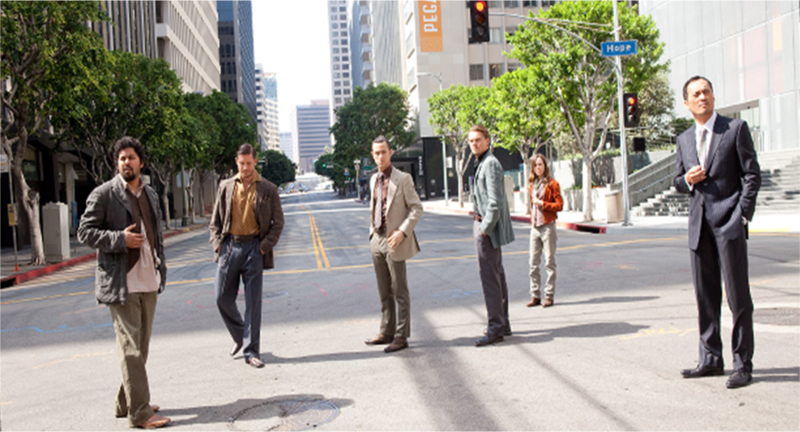 Inception is outstanding and quite frankly, bloody genius. Just don’t fall asleep in the middle of it – or else you could be waking up with some “radical notions”. I love your comment to Michael Bay because it’s so true! I honestly had to watch Inception a few of times, and I enjoyed it each time. It’s probably a good thing that I don’t have to worry about late fees from Blockbuster @Home because I think I kept that movie for almost three weeks before mailing it back. Not only was the story and script wonderfully made, but the star-studded cast did very well. Actually, now that I think of it, a few of the cast members started getting larger parts in other films because of Inception. Thanks for taking the time to review this, and I’ll be sure to send my co-workers at Dish this way who have had second thoughts about Christopher Nolan!